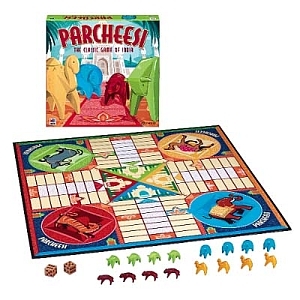 Parcheesi is an American adaptation of the Indian game Pachisi. 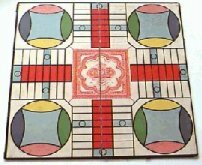 It has somewhat contemptuous been described as an westernized, simplified and less skillful version of Pachisi, and only suited as a family or children's game. But as Parlett (1999, pg.48) says: "Parcheesi...is of all western derivatives the least divergent from its Indian model". It is a all-against-all game (versus Pachisi partnership game1), but does include blockading and safety zones. It's early history in the USA is shrouded in fog and uncertainty. Several sources contradicts each other2. But there is evidence for home-made boards and boards without a clear origin from the 1850s. A story credits Sam Loyd as the inventor of Parcheesi, but this is very doubtful. Mr. Loyd is known as a notorious self-publicist and deciever. The earliest trustworthy information is that John Hamilton of the Hudson River Valley claimed copyright to the game in 1867. This version was called Patcheesi. 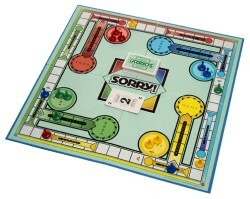 The name was changed to Parcheesi in 1869 (by Hamilton) or 1868 (by Swift). The rights were sold to Albert Swift (a New York fancy-goods manufacturer) in 1868 (another source says 1867...), who in 1869 (or 1870) sold the rights to game manufacturer E.G. Selchow & Co (New York City). Parcheesi was first published around 1870. They copyrighted and trademarked the name of the game again in 1874 since they merged with John Righter and become Selchow and Righter Co.
Today Hasbro Inc. owns the rights to Parcheesi for the North American market. Parcheesi is played with two dice and the goal of the game is to take each of four colored pawns to the center square. The Parcheesi board has sixty-eight squares in all. Sixteen of these are safe squares (squares where one's pawn cannot be "eaten" -- forced to return to start -- by an opponent's). A pawn that does catch up to an opponent's pawn on an unsafe square "eats" it and then continues the rest of the player's turn. When a player sends another player's pawn back to its nest, that player gains 20 points that he may move with only one of his pawns. Five has a special value in this game because it serves to get pawns out of the nest where they begin the game. When a five is tossed, the player can get a pawn out of the nest and begin to move around the board. With double fives, a player can get two of them out. It is not possible to place more than two pawns in the same square. Two of a single player's pawns can form a blockade when they share the same space. It is destroyed when one of the two pawns moves or when there is no other way to move for any pawn than by passing over the blockade. When a doublet (pair) is tossed, the player gains an extra turn. In addition, if all the pawns are outside the nest, the values below the dice can also be used. For example, a player who rolls 6-6 can also move 1-1 with either the same pawns or different ones. With two pawns on the board, a player can move 7 with one pawn and 7 with another one. With three pawns a player can move 6-1-7, and with 4 a player can move 6-6-1-1. Therefore, with this type of play, the player always moves one or more pawns a total of fourteen spaces. If all of the 14 cannot be used, the turn is forfeited. A player with 3 consecutive doublets can automatically take a pawn to the center square. When a pawn enters the arrival square by exact count, the player gains 10 points that can be used to move one pawn. If this cannot be done with the pawns remaining on the board, the points are lost. "Pachesi" Woolson Spice Co. (Toledo, OH) around 1894.
. (Portland, OR) about 1940. "Game of India" (Milton Bradley, 1901/1910). All of these versions of the game use standard dice as the "chance" device. 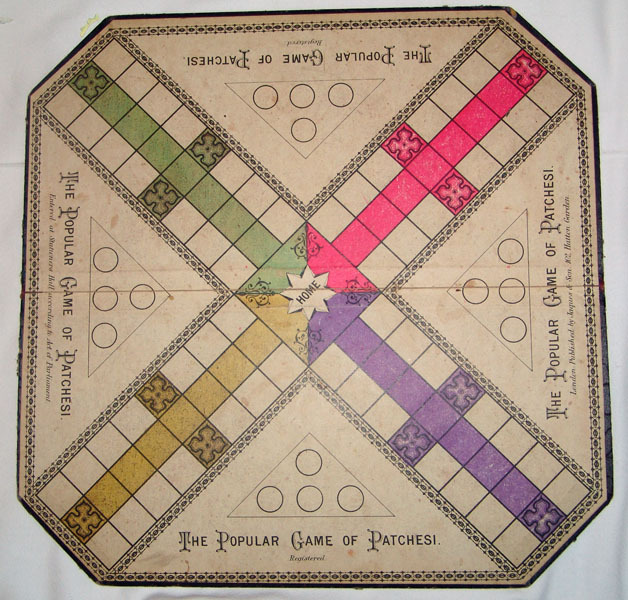 A Pachisi variant based upon the novel Pollyanna by Eleanor H. Porter (1913). The board uses pictures of characters from the book. (Nathan Reinhertz, Corey Games, 1944). A proprietary race game that resembles Pachisi and Aggravation. The earliest known WAHOO boards are from 1962. Popular in Texas and Oklahoma. The name resembles an American Indian war cry and the board is printed with Indian braves and teepees. Rules available at Traditional Game & Toy Co.
A variant first made in 1934 (Waddingtons, UK) (or 1932?). Licensed to Parker Brothers. Instead of throwing a a dice, you draw cards. The 45 playing cards specify distance, bonuses and penalties. The original cruciform track is replaced with a peripheral square track. 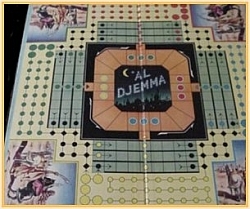 4 player game.